Last week I published a support model to forecast the results of the Democratic primaries in the Acela primary. 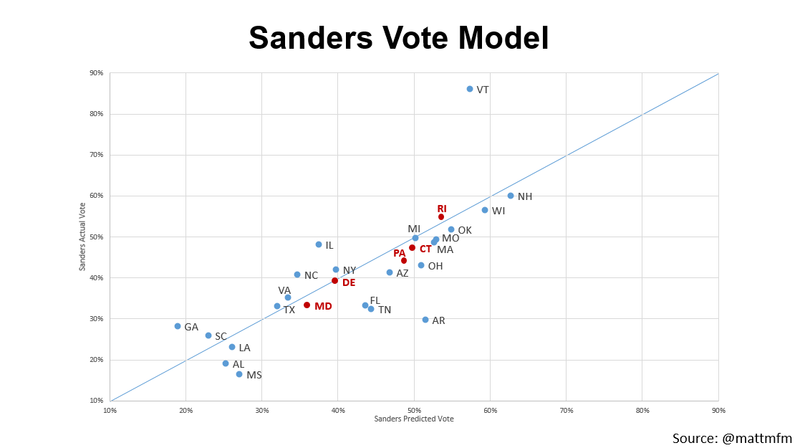 Polling was sparse, particularly in Rhode Island and Delaware, so I wanted to build out a model to predict Sanders’ predict vote in each state. The predictors included: percentage of white men, white women, African Americans, self-identified Democrats, self-identified Liberals, and non-college white voters in the electorate. Overall the model just about nailed the actual vote for Sanders, with an average error across the five states of 1.89 percent. It was most accurate in Rhode Island and Delaware, the two states with the least amount of polling ahead of the primary. Sanders underperformed the model by a slightly greater margin in Pennsylvania. Looking ahead, Democrats have four primary contests in the month of May: Indiana on May 3, followed by West Virginia, Kentucky, and Oregon later in the month. The model actually predicts Sanders is the favorite in 3 of the 4 upcoming contests: Indiana, West Virginia, and Oregon. Sanders should have a slight demographic advantage in Indiana, with 54% of the vote. Notably, what little polling released so far actually shows Clinton with a small, single-digit lead in the state. 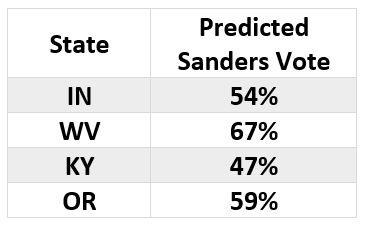 The model predicts Sanders has a much more significant lead in West Virginia and, to a lesser extent, Oregon. Kentucky, a closed primary with a larger percent of African American voters, is the only state in which Clinton holds a slight advantage. It looks like it could be a good month for Sanders, right? Well, not really. As it stands today, Sanders needs to win roughly 64% of the remaining pledged delegates to even bring Clinton to a draw. Even if he wins 3 of the 4 contests in May, some by significant margins, because of proportional allocation Sanders will only net roughly +21 delegates. Given the waning number of pledged delegates available, even by winning these races Sanders will wind up falling further behind in his ability to win a majority of pledged delegates. 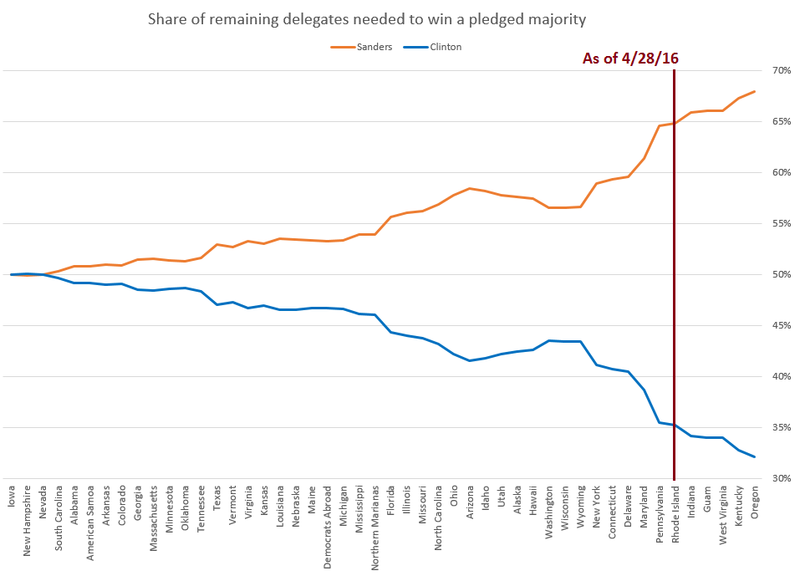 In fact, by the end of May, he will need to win roughly 68% of all remaining pledged delegates to even close the gap with Clinton. Practically speaking, the Democratic primary is over and Hillary Clinton is the presumptive nominee. Even in races she loses in the month ahead, the proportional system of delegate allocation prohibits Sanders from making inroads into her substantial delegate lead. In fact, if she manages to exceed model expectations in the upcoming four primaries, and has a dominating win in Puerto Rico, it’s mathematically possible that Clinton secures the nomination before the California primary on June 7.